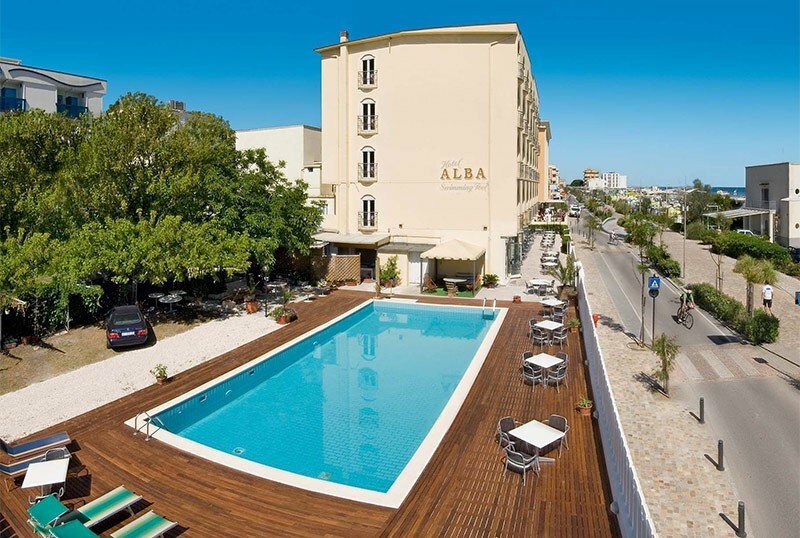 Located in Misano Adriatico facing the sea, Hotel Alba is a family-run property with swimming pool, free parking, solarium and children's facilities. Admits animals of small and medium size. 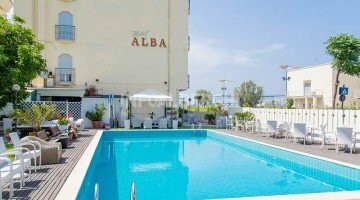 Hotel Alba is located in Misano Adriatico, overlooking the seafront, right in front of the beach and close to the center. The rooms are equipped with WI-FI, digital terrestrial TV, telephone, private bathroom with shower and hairdryer. ECONOMY SEA VIEW: economy with sea view. CLASSIC SEA VIEW: classic with sea view on request. SUPERIOR: air conditioning, LCD TV, safe, minibar. SUPERIOR SEA VIEW: all the Superior and sea view services. SUPERIOR FAMILY: they are even more spacious themed rooms that are distinguished in: Nemo, Simpson or Country fish. All recently furnished and complete with the comforts of the previous rooms. Swimming pool with sun terrace by the pool, garden, open-air porch, reading room, bar, elevator. Theme nights are organized. PARKING: free, covered and uncovered, available to all guests. AIR CONDITIONING : also present in the room. CONVENTIONS : beach, thermal baths, amusement parks, shuttle service on request. Possibility of organized excursions. LUNCH AND DINNER : three menus to choose from, with meat and fish dishes accompanied by raw and cooked vegetables. Pasta and desserts are homemade. OTHER: in addition to being able to eat in the air-conditioned dining room, guests can have lunch and dinner by the pool, even in the company of their pets. In hotel: indoor and outdoor playground area, entertainment, strollers. On request: baby sitter and pediatrician. At meals : kitchenette for mothers (with fridge, microwave oven, bottle warmer, fresh milk, vegetable soup, vegetable broth), baby food, high chairs, baby menu on request, placemats to color. The hotel has an outdoor pool surrounded by a wooden sundeck area with loungers. It is possible to have aperitifs and lunches at the poolside. The hotel has an agreement with the beaches n. 45, 46, 47, establishments organized with spaces and services for children and adults. The list prices are per person per day in full board for a min. of 3 days. TOURIST TAX: not included, to be paid locally. It amounts to € 1.00 per day per person for the first 7 days of stay. Children up to the age of 13 are excluded. - Meals not consumed will not be deducted from the bill but replaced with a basket. For those who book by 31/01/2019 the 2018 rates will be maintained. Take advantage of this fantastic offer. Do not miss the Truck Driver Weekend - Truck Weekend - at the Marco Simoncelli Circuit in Misano on the weekend of 25 and 26 May 2019.